June 5, 1917: A Day Well-Documented, Yet Largely Forgotten (from the print edition of "Winning World War I," Issue No. 03 (June 2017)). In May 1917 there wasn’t a whole lot that a citizen of Harrison County could do on his or her own regarding war preparations. It wasn’t like the Civil War, when willing young men would hop on a horse or take a train to travel with other like-minded citizens of the county and head for whichever side suited their sense of patriotism or politics. Before America’s declaration of war in April a few Americans, for reasons of their own, actually had traveled abroad to volunteer for service in the militaries of the Allied or Axis powers. For most, however, there wasn’t much to do except for to get ready for June, and June 5 in particular. That was the day that had been designated as Registration Day, i.e., registration for the new draft. The routine of war was a whole new world for a citizenry which had experienced nearly a half-century of peace, and whatever resistence there had been to committing militarily to the European conflict since 1914 was largely pushed aside with the steady rollout of proclamations and regulations. “Get Ready for the Draft”—That was the title of the May 31, 1917 Democrat article (p. 10, col. 1) that, although relegated to page ten, was probably read with great interest by more subscribers than any other that year. The article said that “in order that those who will be required to register may familiarize themselves with the registration we publish the … rules for the guidance of both officers of registration and men who must register.” It was a “cheat sheet” of sorts. But more about that later. Cynthiana had a party planned. June 5th was a Tuesday, and it rained some that morning, just enough to dampen the city, but not its spirits. In the afternoon the streets “were a mass of humanity, each struggling for a point of vantage to witness the parade or hear the address[es].” The flag was raised at the courthouse was at 10:30, followed by a few speeches and even recitations of poems. The sun did came out, but “the day became if anything too warm for comfort” for the large crowds in attendance. The parade scheduled for 1:30 was said to have been “one of the longest parades the town has seen.” The procession included mounted police, ladies on horseback, boys on ponies, a regimental band, the registrants themselves, decorated auto cars, Red Cross in automobiles, Boy Scouts, Elks, Odd Fellows, Knights of Pythias, Masons, Jr. Order U.A.M., school children, high school students and "bicycles, buggies, etc.” Did anyone miss out? The coverage of other communities was minimal, but the paper did publish a list of where regristrants of Cynthiana and other registrants were to go. The precincts listed with their respective registrars and assistant registrars were broken down and listed as follows: Lumber Yard, L.C. Rice, J.M. Douglas; Engine House, John W. Woodhead[,] John T. McKee; Court House, L. Benton, J.B. Berry; River, Chas. L. Ewing, Edgar Gragg; Elmarch, Homer McCauley, C.K. Bailey; Oddville, J.J. Rose, Fred Toadvine; Sylvandell, Luther Mastin, Everett Hickman; Park, W.T. Payne, R.T. Berry; Lair, Jno. W. Hinkson, John Jett; Leesburg, J.M. Brock, Frank May; Belmont, W.H. Ashcraft, W.W. Ammerman; Cason, Leslie Martin, Jno. Magee; Connersville, J.L. Burgess, J.T. Laughlin; Kinman, George Renaker, J.J. Baker; Berry, Harry Berry, J.H. Doan; Colemansville, Frank Day, Ira Elmore; Claysville, T.W. Beckett, A.J. McDowell; Richland, E.C. Elliott, Orie Sandy; and Poindexter, I.J. Caldwell, C.T. Barnes. What Did the Registrars Want to Know?—If you are a genealogist or family historian, then you probably have seen at least a few of the draft registration cards generated by the three registrations: the first and second registrations of June 4, 1917 and 1918 repectively (The second registration also includes the Aug. 24, 1918 registration of men who had turned twenty-one since June 5), and that of Sept. 12, 1918. By the time the war ended on November 11, 1918, nearly 25 million men had registered, almost a quarter of the entire U.S. population. It was almost an absolutely complete record as it included almost ninety-eight percent of all males who were required to register. The May 31 Democrat provided its readership a cheat-sheet of sorts, i.e. a list of all the questions that registrants should be prepared for. 1. Name in full? Age in Years? This means your name as you ordinarily sign it. If you sign only your initials as “S.L. Brown” give that as your name. If you sign “Samuel L. Brown” give you name in that way, or if “S. Lawrence Brown” give it that way. State your age today in years only. Disregard additional months today. Be prepared to say “10” or “25” not “19 years, 3 months” or the like. 2. Home Address. This means the place where you have your permanent home, not the place where you work. Be prepared to give the address this way: “232 Main street, Chicago, Cook county, Illinois” that is give the number and name of street first, then town, then county and state. 3. Date of Birth. Start to answer as you would if some one asked you your birthday, as “August 5th.” Then say, “on my birthday this year I will be (or was) . . . . . years old.” The registrar will then fill in the year of birth. Many people do not carry in mind the year they were born. This may be obtained by the registrar by subtracting the age in years on this year’s birthday from 1917. 4. Are you (1) a natural born citizen; (2) a naturalized citizen; (3) an alien; (4) or have you declared your intention to become a citizen. Specify which. (1). If you were born in the United States including Alaska and Hawaii you are a natural born citizen no matter what may have been the citizenship or nationality of your parents. 6. If not a citizen, of what country are you a citizen or subject? If you are working for an individual, firm, corporation or association state its name. If in business, trade profession or employment for yourself, so state. If you are an officer of the State or federal government say whether your office is under the United States, the States, the county, or a municipality. In answer to the question as to where you are employed, give the town, county and State where you work. 9. Have you a father, mother, wife, child under twelve, or a sister, or brother under twelve solely dependent upon you for support? (Specify which.) Consider your answer thoughtfully. If it is true that there is another mouth than your own which you alone have a duty to feed, do not let your military ardor interfere with the wish of the nation to reduce war’s misery to a minimum. On the other hand, unless the person you have in mind is solely dependent upon you, do not hide behind petticoats or children. Remember that this answer alone will not exempt you from liability or service. 11. What military service have you had? Rank? Branch? Years? Nation or State? No matter what country you served you must give complete information. In answering these questions, first name your rank, next state the branch in which you served, next state the number of years service, not counting time spent in the reserve. Finally name the nation or State you served. 12. Do you claim exemption from draft? Specify grounds. Because you claim exemption from draft, it by no means follows that you are exempt. For the information of the war department you should make a claim now if you intend to prosecute it. Some persons will be exempted on account of their occupations or office. Some on account of the fact that they have relatives dependent upon them for support. You answer touching these things will be important in supporting the claim you intend to make in answer to these questions. Be sure, therefore, that the grounds you now state are in conformity with your answers to questions 7 and 8. In stating ground you claim as exempting you use one of the following terms: If you claim to be an executive, legislative or judicial officer of the State or nation, name your office and say whether it is an office of the State or nation; if you are in the military or naval service and this is your ground, simply say “military service of the United States” or “Naval service of the United States.” If you claim to be a member of a religious sect whose creed forbids its members to participate in war in any form simply name the sect. If you are employed in the transmission of the United States mails or as an articifer or workman in an armory, arsenal or naval yard of the United States, if you are a mariner employed in the sea service of any citizen or merchant within the United States so state. If you are a felon or otherwise morally deficient and desire to claim exemption on that ground, state your ground briefly. If you claim physical debility, state that briefly. Fame, Fate, & Fortune—Kentuckians of every every background registered, some younger, some older, some famous, a few privileged, most were not so. It is interesting to search the WWI registration databases at FamilySearch.org or Ancestry for those who had yet to make their fortunes, such as Kentucky Governor Albert B. “Happy”Chandler or Colonel Harlan Sanders, or who met their fate earlier than expected, as William Floyd Collins did in Mammoth Cave.. Few soldiers thought of fame or fortune; most just wanted to come back alive. Thankfully, most did. There isn’t enough room on these pages to tell all that there is of the records, or what you can do with them, but if you want to know and explore more, just visit www.WinningWorldWarI.com and, in addition to the articles posted there, look for the list of links under “Finding the Records for Soldiers, Sailors, & Marines of Kentucky, Ohio, & Indiana.” And, as always, check out the resources on the WWI homepage at HarrisonCountyKy.US. Charlie Ackman was a married 39-year-old, tall with a slender build, with gray eyes and black hair. He was a resident of Cynthiana and a section foreman with the L.& N. Railroad, and he was the first. 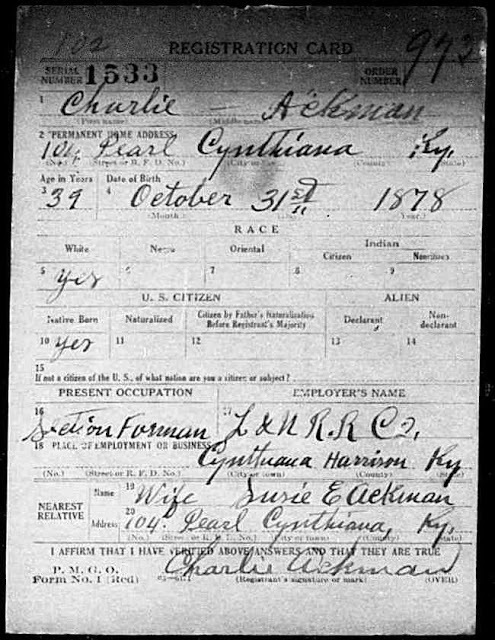 The 1918 draft registration card of Charlie Ackman. A tall, blue-eyed, black-haired Henry Yarnell was a married 28-year-old farmer and a native of Broadwell in Harrison County. He was the last. 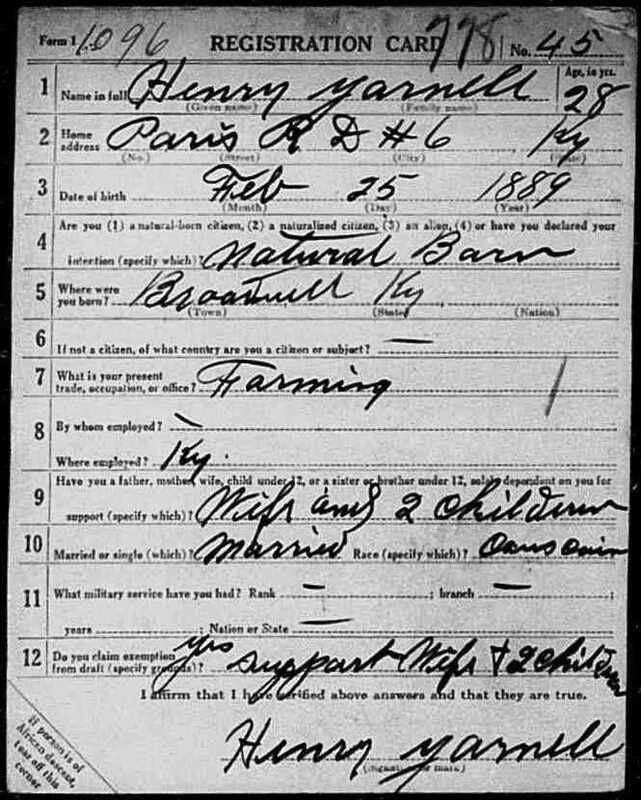 The 1917 draft registration card of Henry Yarnell. Just what was it that this two did? 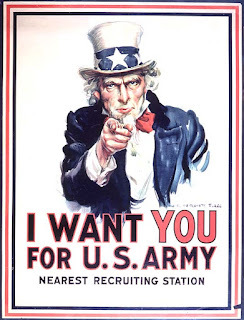 Uncle Sam was calling on men from across the U.S. to register for the draft as required by the Selective Service Act of 1917 and both did what many would do just by showing up on Registration Day in 1917 and 1918. The records of Messrs. Ackman and Yarnell are the first and last registrations you come to respectively in the microfilmed records, now digitized, of World War I draft registrations from 1917 and 1918 that exist for Harrison County, Kentucky, nearly 3,200 in all. 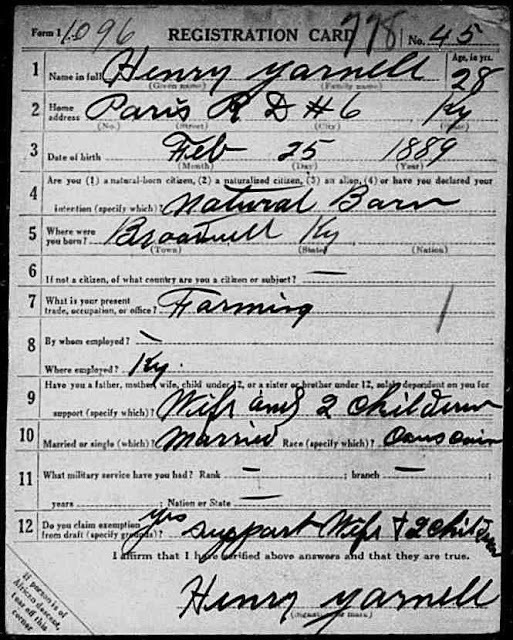 Henry Yarnell registered during the first registration on June 5, 1917. There were three in all in the fifteen months from June 5, 1917 to Sept. 12, 1918. At first Uncle Sam only wanted men aged 21 to 39. The age range was extended to 18 to 45-year-olds for the last registration, when Charlie Ackman filled out his card over a year later. It appears from search of Harrison County records that neither was called upon to serve with Uncle Sam. The collection of cards they helped to fill out form what might be considered a rather unique and detailed census of nearly a quarter of the population at the time it was created., a record that the genealogist of today uses as an aid in filling out blanks in family trees. In 1917 the info on the cards was helped to fill in the ranks of an Army that made all the difference in winning World War I. To learn more about the draft and Registration Day just look to the next post on this blog, which was taken from the print edition of "Winning World War I" (Issue No. 3 (June 2017)). 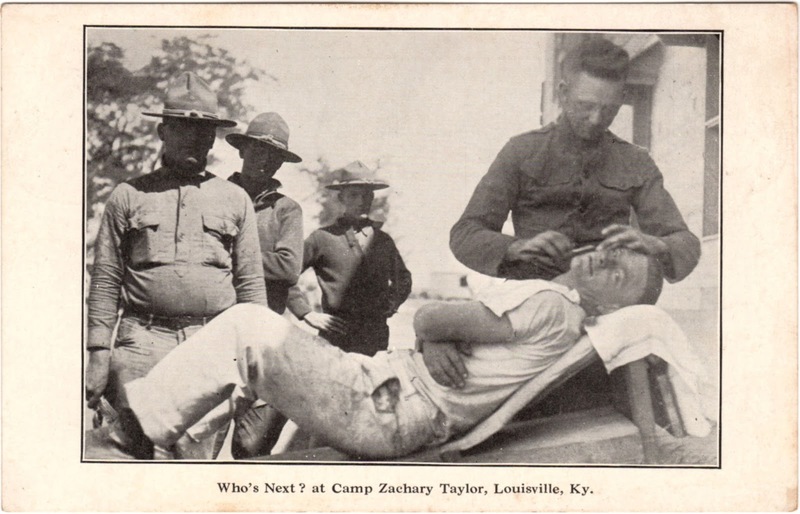 As promised, here are a few images of postcards showing what life was like at Camp Zachary Taylor which have yet to be added to the the World War I pages of my website at www.HarrisoCountyKy.US. Such images bring the past alive in a way nothing else can. It is almost, but not quite, like you were there. 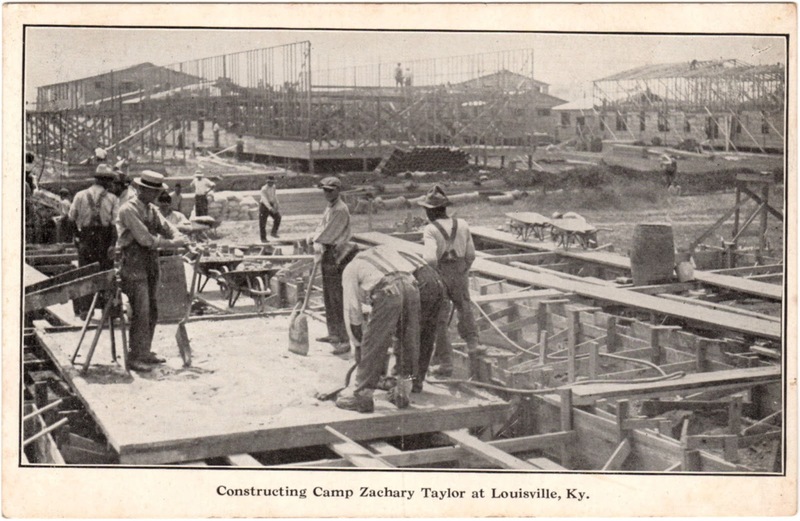 A Message from Camp Zachary Taylor, Louisville, Ky.
Constructing Camp Zachary Taylor at Louisville, Ky. Taking fresh air and sunshine on a typical ward porch. Forts, bases, camps, and posts—Whatever you call them, military installations have followed the American frontiersman, settler, and soldier from the earliest days of colonization on the Eastern Seaboard to the far western limits of settlement and statehood on the Pacific Coast. Usually strategic considerations led to their placement along important migration routes or on the naton’s everchanging borders. Many, if not most, became rather permanent fixtures, if not the hubs, of new settlements wherever they were situated. Having been with the Army when my father was in the Army for 26 years, I have lived, gone to school or worked on many in this country and abroad. They served not only as a workplace for the solider but as a family home away from home. West Point, one of the oldest, was one such home for me and it seems it will be around for some time to come. With the end of the Cold War, many military bases, which spanned two if not three centuries of service in the United States, have been closed down. Some such as Ft. Sheridan north of Chicago and Ft. Benjamin Harrison in Indianapolis have been closed down, yet they and others still operate in new civilian capacities, with the old buildings still standing as reminders of more turbulent and uncertain times. With America’s entry in to World War I, the U.S. government determined that the country’s established military sites weren’t enough to process and train the hundreds of thousands of men who would be drafted or signing up to be trained as soldiers, sailors, or marines, who would afterwards be sent abroad to the Western Front in France with the American Expeditionary Force (AEF) or supporting the efforts of the AEF. And so communities throughout the nation were asked to compete for a total of sixteen new military camps. 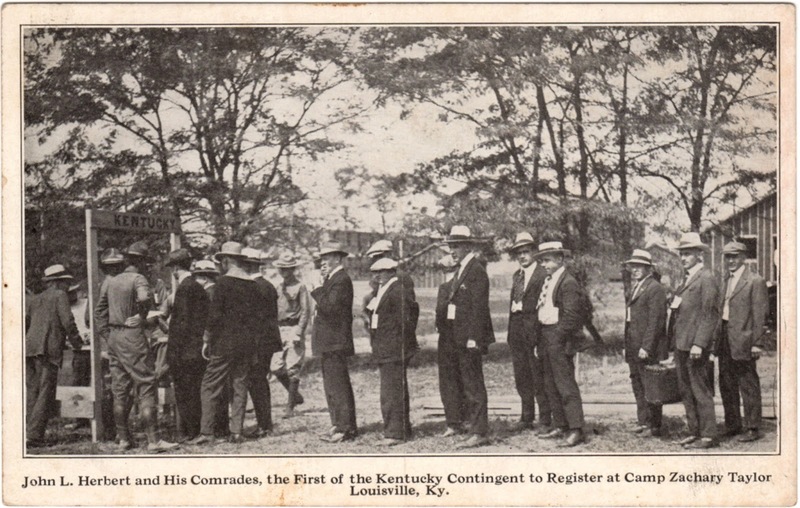 On June 11, 1917 Louisville’s bid beat out ten cities in Kentucky, Indiana and Illinois, partly due to the city’s proximity to a Civil War-era, 16,000-acre artillery range (later known as Ft. Knox). 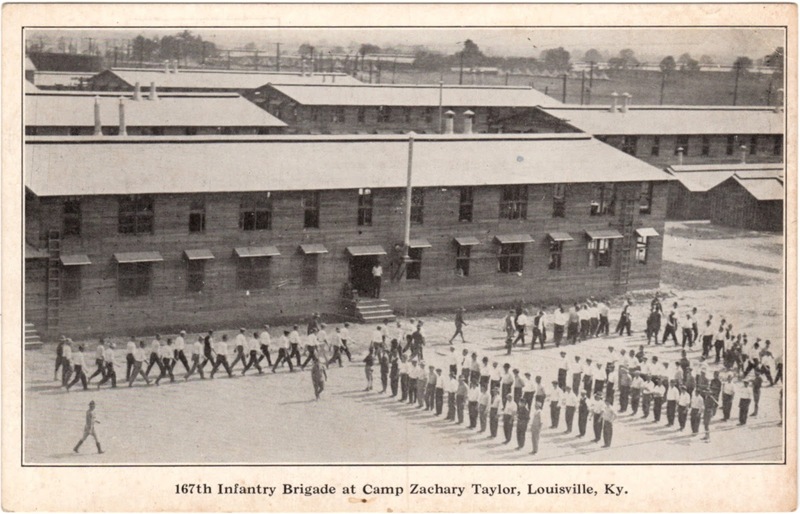 And last, but not least ... Camp Zachary Taylor, Ky. In the spring of 1917 events were moving at a rapid pace across the nation. The first registration for the national draft had already taken place on June 5, and on June 21 the Cynthiana Democrat published what they called “Harrison County’s Roll of Honor … a complete list of the Harrison [1,218] county men, between the ages of 21 and 30 inclusive, who registered for military service.” Many who ended up answering Uncle Sam’s call might not have heard where they would report for duty until the Cynthiana Democrat of July 19, 1917 (p. 10, col. 5) reported that “Louisville's national army cantonment will be known as Camp Taylor … in honor of Maj. Gen. Zachary Taylor,” who was an early settler of Louisville, a Mexican War general known as “Old Rough & Ready, and 12th President of the United States. This military city for the soldiers has been a center of great activity and Uncle Sam has spent close to $6,000,000 in constructing it. 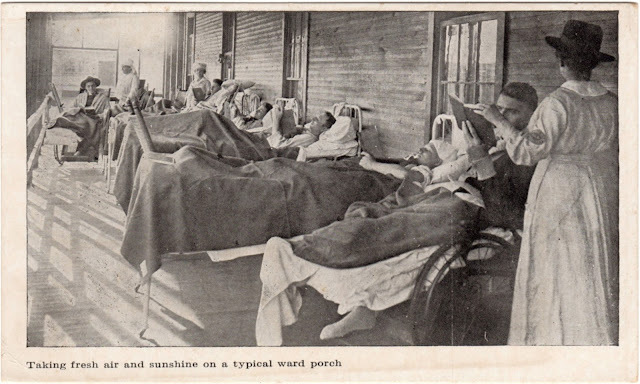 The number of employe[e]s working on it one week-jumped to 10,000 men and special trains were required to carry the men to and from the camp to their homes in the city. 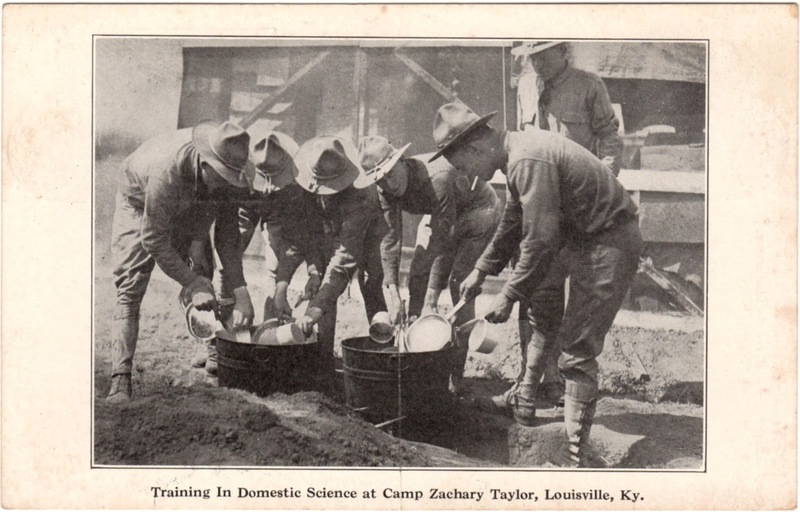 After ninety days of hard work, including Sundays, the first lots of drafted men reported for military duty on September 5, 1917 … [and one of the] first drafted men from the three states [served by Camp Zachary Taylor was] Lester C. Monk, a twenty-two-year-old farmer from Jersey County, Illinois. It was just 9:03 o'clock on that September morning when this young son of democracy became a member of the camp. Next came Ward H. McCormack, a Shriner from Bedford, Ind., the first Indianian to report, and soon afterwards came John Lee Herbert of 1717 Payne street, Louisville, and the first Louisville and Kentucky man to report for military service under the selective service law. 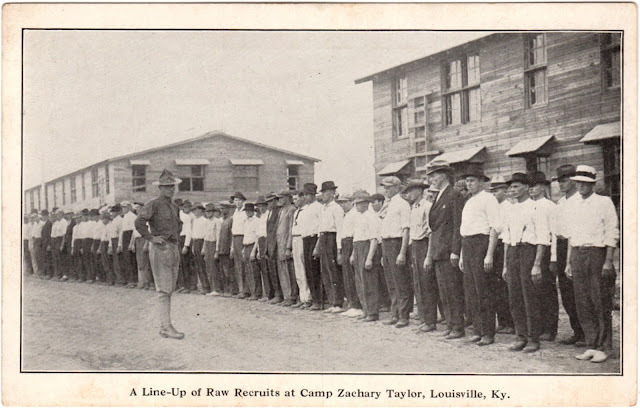 These men were pleased with their reception and commented on how the stretches and surroundings of Camp Zachary Taylor impressed them. On that day these soldiers ate their first food in military life. The menu was palatable to all and consisted of sirloin steak with brown gravy, mashed potatoes, stewed tomatoes, peach roll, bread and butter and ice tea. That was the food the government served the selected man on that day. Others from Harrison may have arrived at Camp Taylor before this article was published, but, as far as can be told based on the general war reporting by the Democrat, this appears to be the first large contingent of young men from the county to got to the camp. The forty-seven were: Hervey Webster, Cynthiana; Wm. Ziegler, Berry; Clarence Dennis, Cynthiana[,] R. 3; Walter D. Lemons, Sadieville, R. 2; Cren Giles, Sadieville, R.D. 2; Nim A Turner, Cynthiana, R.D. 2; Wm. Henry Heck, Lair; Omer Mastin, Cynthiana, R.D. 2; J.P Denniston, Leesburg; Paul B. Lail, Cynthiana; Geo. F. Tucker, Kentontown; Otis Nickell, Cynthiana, R.D. 2; Herbert L. Bell, Boyd; Harry D. Whitaker, Cynthiana; Frank New, Berry, R.D. 3; Joe W. Minor, Cynthiana[,] R.D. 1; W. Rolah Williams, Cynthiana, 3; Felix A. Barney, Cynthiana; Jno. Goodnight, Cynthiana, R. 1; Swinfred Lemons, Cynthiana; Jos. B. Ross, Cynthiana, R.D. 8; John T. Feix, Cynthiana, R.D. 3; Omer C. Faulkner, Leesburg; Lora Batson Rankin, Cynthiana, 9; Calvin Wright, Cynthiana, R.D. 9; John Coy, Sunrise; John Hudgins, Cynthiana; Frank J. Ross, Cynthiana, R.D. 8; K.C. Smith, Cynthiana; Archie M. Batte, Mt. Olivet, R. 1; Jesse White, Cynthiana, R.D. 4; Ray Terry, Berry, R.D. 3; Estill P. Wiggins, Cynthiana, R. 3; Atwell Pope, Cynthiana, R.D. 8; Chas. Williams, Cynthiana, R.D. 8; Joe Frederick, Cynthiana, R.D. 8; H.R. Wiglesworth, Cynthiana; Sidney Berry, Cynthiana, R.D. 6; J.L. Scott, Jr., Lair; Forrest McDowell, Cynthiana, 2; Clemence Waxman, Cynthiana, 9; H.C. Cleveland, Cynthiana, R. 3; Frank Puccini, Milford, Ky; Henry L. Ewing, Cynthiana; Mike King, Cynthiana, R.D. 2; Clarence Florence, Cynthiana; and Wm. Shingleton, Cynthiana. Do You Want to Learn More?—There isn’t enough space in this modest newsletter to go into the entire history of Camp Zachary Taylor, despite its brief existence. If you would like to learn more about the history of the camp there are a few “outposts on the web” which offer information about a place so many from Harrison County saw as a temporary home away from home, as much as any training camp could be. “The history of Camp Taylor — from WWI military camp to working-class neighborhood” at InsiderLouisville.com was published a year ago upon the 99th anniversary of the establishment and construction of the camp. It offers up a fine history of the camp, noting what has become of the buildings and land that were used to train and house so many from Harrison County and the midwest. 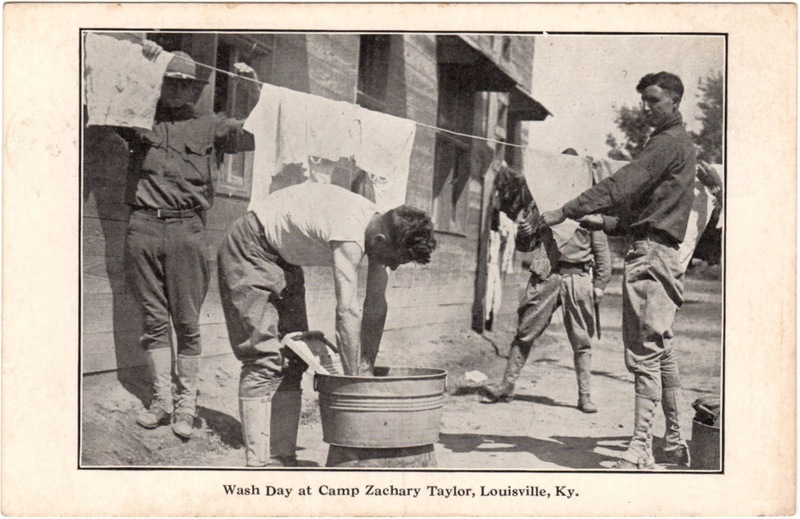 The Camp Zachary Taylor Historical Society at CampTaylorHistorical.org has had a presence on the web in various forms for some time now; the format is now that of a blog and its first post was in 2012. There is a lot to look at and a lot to learn about as you scroll through past posts. FortWiki.com not only has a link to information about Camp Taylor, but can help lead you to information about other military installations that are of interest to you. Not all from Harrison went to Camp Zachary Taylor. Camp Chase, Oh., Ft. Harrison, In., and Ft. Thomas, Ky. are among the many others which the men from Harrison County might have trained or just passed through. Camp Zachary Taylor Souvenir by Maurice Dunn is an interesting booklet produced during the war. It is chockful of pictures and offers maybe a few too many details about what life was like at the WWI camp. Images and texts can be found at the Kentucky Digital Library (click on the title above), or just do a Google search to find transcriptions that you may use to cut and paste for your own use. One such transcription appears at HarrisonCountyKy.US. 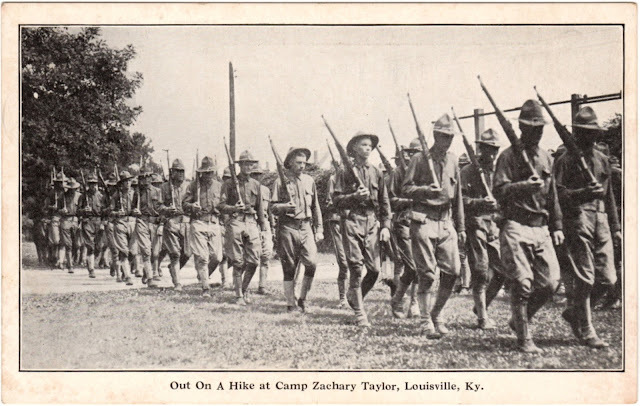 Just follow the links to Camp Zachary Taylor, Kentucky (Information about other camps and bases appears at this site; just follow the links from the WWI homepage). 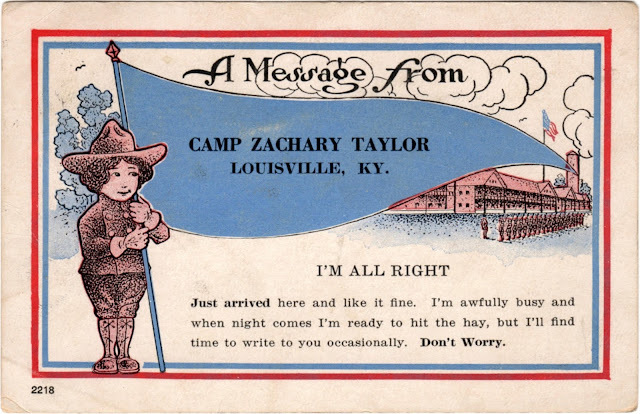 In the next post to this blog is something for your viewing pleasure—a few images of postcards showing what life was like at Camp Zachary Taylor which have yet to be added to the website. Such images bring the past alive in a way nothing else can. It is almost, but not quite, like you were there. With the addition of New Mexico and Arizona in 1912 (Jan. 6 and Feb 14 respectively) President Taft signed an order that June which established the new proportions of the U.S. flag and which provided for arrangement of the stars in six horizontal rows of eight each. This flag was in service for 47 years, longer than any other, and it was the one which anyone saw anywhere during two world wars. Advertisements for Wrigley’s chewing gum, like this one here, often appeared within the pages of Harrison County’s newsweeklies. Advertisement from the Cynthiana Democrat, September 6, 1917. A century seems like a long time ago, but you can still go to the neighborhood grocery or convenience store to see and experience an “artifact” from a time that itself had long ago faded from the average American’s consciousness. Chewing gum and cigarettes, not exactly good for anyone’s health … but neither was the war that so many from Harrison County were asked to fight. Labels: "Smokes", Advertisements, Chewing Tobacco, Harrison County Newpapers, Personal Care Items, Razors, Socks, Tobacco, Wrigley's Chewing Gum, Y.M.C.A. It Was War, No Matter What You Call It—A century ago this month the United States entered a war that began two-and-a-half-years earlier in Europe. A spark of fanaticism in the Balkans had set the the whole of Europe on fire, it seemed. At first it was called the “Great War.” It was hoped it would be the “War to End All Wars.” It wouldn’t be too long before it was referred to as the First World War, or just World War I. If you remember anything from high school history class, you know it became the Allies versus the Axis in a showdown that by 1917 had resulted in a bloody stalemate. Europe had become a continent cleaved by destruction, measured in millions of lives lost and ruined. Americans had wanted no part of it and in 1916 President Woodrow Wilson got reelected on the platform of keeping the U.S. out of it. Circumstances changed, however. The German’s unrestricted submarine warfare and their efforts to recruit Mexico as an ally made neutrality difficult to maintain anymore. America’s involvement would be brief compared to the war’s overall length, but costly, nonetheless. A Different Pace for a Different Time—Today we live in a minute-by-minute world where one-issue news cycles of just a day’s length predominate … or “distract” as some would have it. 1917 was a day-by-day world where people got their news by word-of-mouth, by personal letters or postcards, by telegram on special occasions, or through newspaper subscriptions. There was no Twitter, Facebook, or Snapchat. No internet. No cable news. No satellite TV or radio. No radio or TV at all. Harrison County was served by two “news outlets” to use modern terminology. There was the Cynthiana Democrat, which was nominally a Thursday issue. Friday was the publication date of the Log Cabin. News on other days would have been served by dailies delivered by train from Cincinnati, Louisville, or Lexington. During World War I censorship of newspapers would be the new reality, and when the soldiers wrote letters home, those, too, would be censored. Two articles follow. The first is from the Cynthiana Democrat of April 12, 1917 (p. 12, col. 4), republished here in its entirety, and it offers one week’s worth of war events, any one of which could have filled a day’s chatter on network or cable news today. Happenings of the Week in a Nutshell for Rapid Consumption. Both the Senate and the House at Washington promptly adopted resolutions declaring a state of war with Germany to exist, and authorizing the President to use all means necessary to bring the war to a successful conclusion. The President’s formal proclamation of a state of war was promulgated Friday. Regulations for the conduct of unnaturalized Germans were set out. They will be untouched if they behave. Ninety-one ships interned since the beginning of the war in American harbors were seized by the government, and their German crews were locked up at Ellis Island. The Government will use the ships if necessary, and maybe pay for them after the war. Sixty Germans connected with various plots and conspiracies were locked up by United States marshals Friday. Other arrests will follow. [A] German submarine base [is] said to be established on Mexican soil in the Gulf of Mexico. On [the] other hand, the Carranza government is said to contemplate ordering all German citizens to leave Mexico. French and English receive news of America’s entry into the war with great demonstrations. 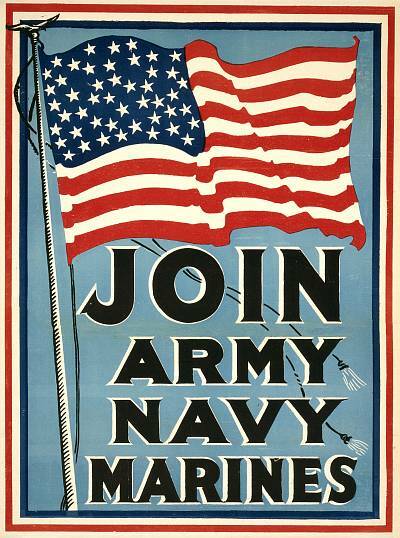 Fifteen thousand men join the navy in three days. The first year of the war may cost the United States five billion dollars. The German crew blew up the gunboat Cormoran in the harbour at Guam on the approach of the United States officers to seize the vessel. Three Germans lost their lives. Thirty-four officers and 321 enlisted men were made prisoners. A prospective slump of fifty million bushels in the crop of winter wheat is the first war feeding problem to confront the country. Cuba, standing by the United States, has declared war on Germany and seized the interned ships in Havana harbor. The Emperor of Germany recommends electoral reforms, to begin after the war is over. A two-billion dollar loan to the Allies is planned by the United States. An immediate bond issue of five billions is forecast. Austria-Hungary has broken diplomatic relations with this country, which means war. Bulgaria and Turkey are expected to follow suit. In the meantime several South American countries are on the verge of declaring war against Germany. President Wilson favors the draft plan for raising an army quickly. Brazil has broken diplomatic relations with Germany, and Argentina has endorsed the stand of the United States. The British continue to make big advances on the Western front, having penetrated from two to six miles and taken 11,000 prisoners and many guns Tuesday. What War Meant—While the safety of America’s borders and the home front were never really threatened during the war, everyone knew what war meant, that is American lives would be at risk. Hundreds of thousands of men, and some women, too, would have to volunteer or be drafted into the armed forces and go “over there,” to Europe, and fight in the trenches and battlefields which had come to serve as graveyards for so many millions already. Bill Passes Both Houses of Congress Saturday. Saturday, both Senate and House voted approval of the Administration’s proposal to raise a great war army on the principle of selective conscription, voting down by overwhelming majorities the volunteer army amendments around which opponents of the Administration plan had centered their fight, and passing the Selective Draft Bill without material change in the more important provisions written into it by the army General Staff and approved by President Wilson. The vote in the House was 279 to 24 and in the Senate 81 to 8. Both Senators James and Beckham voted for the bill. Representative Fields voted for the volunteer plan, but on the final vote swung into line. The Senate bill fixes the age limit at from 21 to 27 years, and the House bill 21 to 40. The difference will be adjusted in conference. Increase of pay for soldiers from $15 to $30 a month was made. When perfected the bill will work about as follows: The President will proclaim a registration day. County sheriffs will appoint registrars to take the names of all males between the prescribed ages at each voting precinct. Those who fail to register will be arrested. County exemption boards will be appointed who will exempt from military service persons engaged in industries, including agriculture, found to be necessary to the maintenance of the military establishment or the effective operation of the military forces, or the maintenance of national interests during the emergency. War department officials will make all further exemptions. Five hundred thousand recruits will be equipped and placed in training camps by August 1, it is hoped. The registration will involve about 7,000,000 men, about 40 per cent of whom it is expected will be rejected for physical unfitness. The jury wheel will probably be used in the drawings. The first name drawn will go with the first 500,000; the second name drawn will be called out for the second 500,000 within six months; the third name drawn will be called out in a year; the fourth name will go with the first 500,000; and so on until all names are drawn. Nobody will be excused; no substitutes can be hired. The rich and poor, white and black, and will be affected alike. How It Will Affect Cynthiana. Numbers of young men of the town and county to whom the war has seemed a thing afar off will find themselves face to face with a stern reality. Just how many will have to go into training on the first turn of the wheel cannot be known until each state’s apportionment is worked out. But some will be called. All will have to register. The physically unfit will not go. Those who have families dependent on them will not go. Those engaged in farm work will not be compelled to go, or those engaged in other occupations essential to the maintenance of the army or military forces. Those who are exempt from conscription, but who still desire to serve their country on the field of battle, may enlist at the regular places before conscription goes into effect and take their places in the regular army. It is said the President will call for 500,000 volunteers. Questions, Questions—Who would go? How would they be chosen? Only partial answers were given in the article above. As the details were worked out, more would be written and published in the county's newspapers. Where were the recruits and draftees from Harrison County go for their training ... and what would happen after that? Camp Zachary Taylor on the outskirts of Louisville, Kentucky would be the first stop for many men from Harrison, and details about the camp will fill out the pages of the next Harrison Heritage News in the special supplement entitled "Winning World War I," ... just like this blog! Just click, read, learn & enjoy! 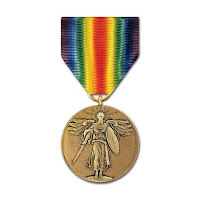 Established in 1919, the medal was customized according to each veteran's service record (Click on the image for more information from The Institute of Heraldry (TIOH), Office of the Administrative Assistant to the Secretary of the Army). CAMP TAYLOR - "The history of Camp Taylor — from WWI military camp to working-class neighborhood"